“HERE, LET ME TAKE ONE of those for you,” I said to my boyfriend, Ned, as I watched him struggle to carry two boxes of recording gear. “No problem,” I said. “After all, we can’t have you getting sweaty before your big interview.” Ned was interviewing Brady Owens, a famous stand-up comedian, for his podcast, NED Talks. He’d been so anxious about getting to the hotel on time that we ended up half an hour early, so we’d been walking laps around the block to help him work off some of his nervous energy. Ned and I have been a couple for a few years and we’ve known each other since we were little kids, but I had never seen him like this. I mean, he’d barely touched his breakfast—usually he’s a bottomless pit and can eat endless amounts of food—but I’d caught his hands shaking as he tried to drink his juice. George is one of my best friends. She has the latest gadgets, and we sometimes joke that she’s part robot because she seems to have an innate sense of how machines work. We may tease her now and then, but I was always really grateful for her tech savvy. A lot of cases would have gone unsolved without her help. “I just wish she’d been able to switch her shift at the Coffee Cabin so she could come with you. I don’t think I’m going to be much help,” I said, looking down at the box I was carrying. “Don’t worry. George was very thorough in explaining how to set everything up. And who could be more of a help than a world-famous detective?” Ned said with a grin. I am an amateur sleuth, and I’ve helped people with stuff like stolen items or blackmail attempts. 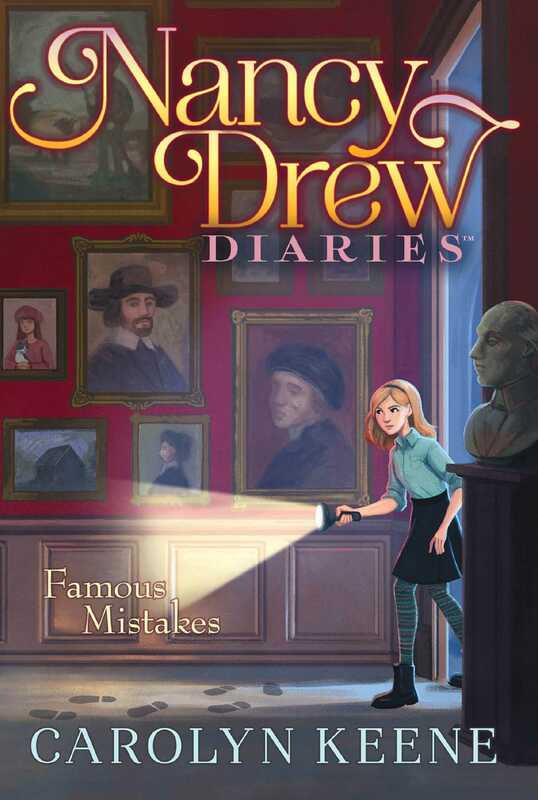 People find a teenage girl detective memorable, so I am known around River Heights area but I’m hardly world-famous. Ned has always been one of my biggest fans. He’s helped me solve a ton of cases. I was glad to return the favor and be able to help him with one of his passions. I may not know how the equipment works, but I do know how to carry a box. I completely understood why Ned was feeling nervous. He had started his NED Talks podcast just over a year ago. He interviewed musicians, actors, and other artists on his college campus. He had a loyal fan base, mostly fellow students at his school, but Brady Owens was on a completely different level than the sophomore singer-songwriter who performed every week at the student center. “I also really don’t want to let your dad down,” Ned said. “He went out on a limb to help me get this interview.” Brady and my dad had been in the same fraternity in college—Brady was actually discovered at an open mic hosted by their fraternity—so when Ned read that Brady was coming back to River Heights to perform at the recently opened Arts Complex, Ned screwed up his courage to ask my dad for an introduction to Brady. We rounded the corner and stood in front of the Towering Heights Resort, the fanciest hotel in town. I checked the time. We were still ten minutes early. “Do you want to do another lap around the block?” I asked. “Let’s watch the video again,” Ned said. “Okay,” I said, pointing toward a bench nearby. “Let’s go over there.” We sat down and I pulled out my phone and typed in Brady Owens Heckler. The first result was the video we were looking for. It had over ten million views. Brady stood onstage in a comedy club, microphone in his hand, pacing in front of a stool. Boos echo throughout the audience, and Brady whips toward her. The expression on his face is livid. There is some laughter and applause in the audience, but there are also gasps and a smattering of boos. The video cut off there, but the reaction was immediate once the video was posted online. People were furious at Brady. They thought he had crossed the line and encouraged violence against the heckler, but Brady was unapologetic. In a series of tweets the next day, he said everyone was being too sensitive. He argued that it was clear he was joking. Besides, stand-up comedians were supposed to offend people. I thought his reaction to the heckler had been way out of line and really dangerous. At the very least, that woman deserved a sincere apology. I knew Ned was planning on pushing Brady on the subject, and I was looking forward to hearing what Brady would say. I checked my watch again. It was time to go. “You ready?” I asked Ned. We both stopped short when we entered the hotel lobby. They had completely renovated since the last time we had been in. “Yeah,” I agreed. The old lobby had been nice, but this was gorgeous. Crystal chandeliers hung from an impossibly high ceiling. The dark mahogany pillars lining the room played off the mahogany welcome counter and tables throughout, along with maroon velvet chairs that were scattered about invitingly. To top it off, a man in a tuxedo played a grand piano in the center of the space. “I knew they were renovating, but I had no idea it was going to be like this,” Ned said. “They must really believe the new Arts Complex is going to bring more tourists to River Heights,” I said. The Arts Complex had been the passion project of the River Heights mayor, and it had just opened last month. It had a theater, where Brady Owens would be performing tonight, that could be used to show movies, plays, or other performances; an art museum, which promised to feature a wide variety of works; and a full set of classrooms and practice spaces that people could rent. They were offering classes in both the actual craft of art, like drawing and painting, and art history. These were the types of classes you would usually find on a university campus, but they were all open to the public. “It looks like the elevators are in that corner,” I said, pointing to the back left. We rode up in silence. I could tell that Ned was running through his questions in his head, and I didn’t want to bother him. We arrived on the eighth floor and stepped off the elevator. “Eight twenty-three is all the way at the end,” I said, reading the signs. Ned nodded and we headed down the long hallway. The carpet was plush beneath our feet. As soon as his knuckles made contact, the door started to swing open. “Maybe he forgot to close the door all the way,” I suggested. I moved in front of him and knocked on the door loudly. “Mr. Owens?” I yelled. There was still no response. I gently pushed the door open, revealing the entire room. “Oh my gosh,” Ned and I said in unison. The room was a mess. It had been completely trashed. Brady’s suitcase had been opened and his clothing was strewn around the entire room. The sheets had been stripped off the bed. The lamps were on the floor, the lightbulbs shattered. Even the paintings had been taken off the wall. I’ve seen a lot of rooms destroyed, but this was one of the most drastically defaced rooms I had ever seen. Not to mention that one very important thing was missing.